The 2019 competitive karate team season will start a bit earlier and last a little longer but there will be well earned breaks. Our dojo will be simultaneously training new karate athletes for sport competition and preparing US Team members to compete in Slovakia at the WUKF world championships! Get stronger in mind and body through NCAAU Karate League competitions. Training karate intensely with coaches and mentors improves speed, agility, endurance, and mental fortitude. Elite athletes learn to do sustained hard work, follow directions, take constructive criticism, figure out their own and other opponents' weaknesses, and perform under stress in ALL aspects of life. The team environment is fun, supportive, and unified. Training season will be Jan. 7 - July 31, 2019. Team training usually adds 3 extra hours a week to your normal schedule. Kumite training one hour on Thursday night for athletes < 12 years, or two hours on Saturday morning for black belts and athletes >13 years. Conditioning training one hour on Friday night, 5:30-6:30 for ages <12, 6:30-7:30 for ages > 13. Each competition provides valuable experience in demonstrating your karate skills and competitive edge, exposes you to AAU rules, and forms new friendships! On Jan. 3, 2019, 6:00-6:30 PM, all Coaches will give a short presentation during Sparring class for Parents and New Athletes. Please download the slides and Packet/Agreement below. Road to the 2019 AAU National Championships: You need to qualify at only one event below but you will want to gain additional experience competing against new opponents and under pressure. 2019 National Championships will be July 2-6, 2019 in Ft. Lauderdale, Florida. Athletes who are white, green, or brown belts will compete on one day and are required to support other team members on at least one other day of the competition. Athletes who are black belts and 13 and older will have the opportunity to compete in indivdual, team kata and team kumite, and up to 8 events across two days. At least six of our athletes have committed to the World Team and will be training for WUKF World Championships in Slovakia, June 20-24, 2019. They are: Clara Carbone, Aydan Gwisdalla, Alexander Horsky, Anna Midyette, Maya Starr, J.J. Yu-Robinson. JUN. 6, 2016 - Five athletes from Triangle's Best Karate, plus one from Goldsboro Okinawan Karate will represent North Carolina as they travel as Team USA to Dublin, Ireland, to compete in the 2016 WUKF World Championships. For details about TBK's five athletes, click here. DEC. 11, 2015 - World Union of Karate Federations (WUKF) posted results [click here] of the WUKF Karate European Champions Cup, hosted in Cluj-Napoca, Romania, Dec. 4-6, 2015. The US Team with 7 athletes including Asia Yu-Robinson of Triangle's Best Karate earned 22 medals overall. Asia Yu-Robinson earned Gold/1st Place in Shotokan Kata, ages 15-17 females as well as Gold/Grand Champion "Best of the Best" of all styles Kata, ages 15-17 females. She also won a Bronze Medal in Individual Sanbon (3-point) Sparring, ages 15-17, and a Bronze Medal in Rotational Team SanBon Sparring. SEP. 1, 2015 -- AAU Karate has announced that five advanced students (black belts) from Triangle's Best Karate have been placed on the US Natonal Team Pool, invited to various international level competitions in Slovenia, Honolulu, and Dublin 2015-16. Congratulations to Brianne Lawton (right in sparring photo), Asia Yu-Robinson, Savannah Fraleigh, Randall John, and JJ Yu-Robinson. Aug. 6-8. 2015 - US Team Trials were held in Chesapeake, VA at the end of the AAU Junior Olympic Games. Team Trials are open to youth and adults. For more info, click here. Competitive karate allows students to test their skills, speed, and focus in individual matches and team events. 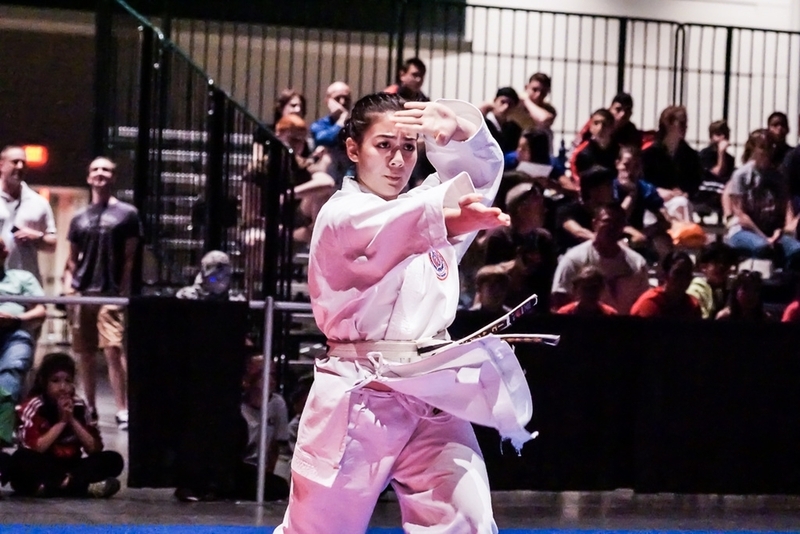 Triangle’s Best Karate has produced dozens of national champions, U.S. National Team members, and is home to nationally recognized coaches and officials. TBK serves as the AAU Karate North Carolina District Director, and hosts the NC AAU Karate state championships (March 14, 2015 in Raleigh) and the AAU Karate Southeast Regional championships (May 2, 2015 in Charlotte). The preparation for state, regional and national competitions includes intense kihon, kata, sparring training and conditioning each week. Elite clinics for high level kata (Unsu, Sochin, GojuShiho, etc.) and advanced kumite are optional and highly recommended for brown and black belts. We build an athlete-coach-family team and set goals together.